Corporate governance has become a household term and investors across the world are demanding more transparency and accountability from controllers of listed corporations. The current resources boom that has been driven by soaring demand from China has brought China’s listed resources companies into focus. Some of these companies are beginning to be known internationally, such as Sinopec, PetroChina, CNOOC (in the oil industry) and CHALCO (aluminium); but their governance structures are often not well known. This book explores the corporate governance of these listed companies. Compared with the governance of global companies, such as BHP Billiton, Rio Tinto, Shell, Shevron, the governance of China’s resources companies has special characteristics. While the authors focus is on the governance of resources companies in China, this book also tackles contemporary issues of resource security and environmental change which are closely related to the depletion of the world’s natural resources. Case studies of other international resources giants such as BHP Billiton, Rio Tinto, Shell and Chevron are provided to enhance our understanding of the differences that exist between them and Chinese resources companies. This book will be of interest to the business community and to those readers who are interested in China and its governance related issues. Understanding Governance in Resources Sector Companies: Is Disclosure Adequate? Are Owners Really in Control? 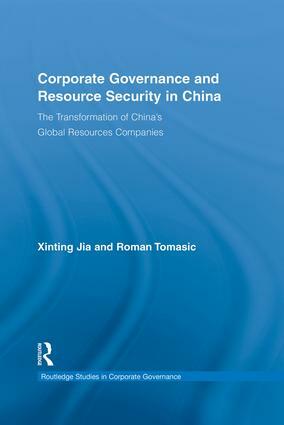 Governing Resources Companies and Corporate Social Responsibility: Can China Do Better?